Looking at the S&P 500 daily chart one could make an argument that it is in the midst of a nice pennant continuation pattern. A break above 1325/1330 would, under this view, confirm a breakout targeting new highs. However, to me the chart looks more like it's putting in a rounding top formation. Interestingly, the same 1320/1325 level would invalidate that view should the S&P500 break above that level convincingly. 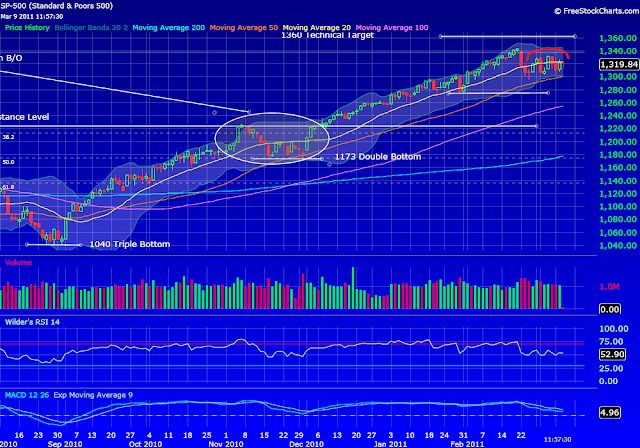 As I type this the S&P 500 is rallying, testing the 1323 level, getting very close to the 1325/1330 area. My view however is that we are in the midst of the 2nd scenario, the rounding top, and will fail resistance and sell off into the afternoon. Fundamentally there are arguments on both side. Clearly the market is looking at easing oil prices as a reason to buy stocks. But the uncertainty in the mid-east is not going away. And seasonally as we get closer to the spring there are reasons to "sell and go away". The market in my opinion is showing signs of weakening. I have been using the intraday bounce today to lighten up on longs that aren't performing, and put on new shorts. 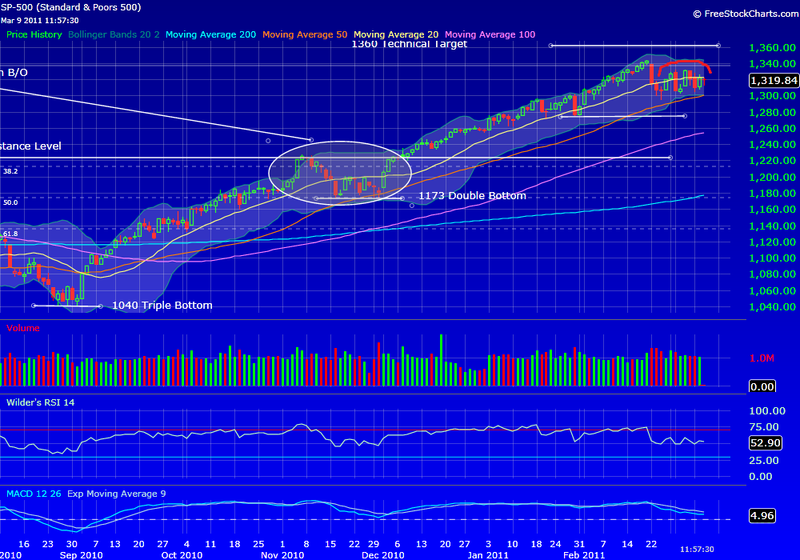 If the S&P fails to close above 1325/1330 I will likely add to these short positions. If I am wrong and the S&P rallies into the afternoon then I will cover my S&P short positions but remain heavy in cash. I don't believe now is the time to be overweight equities.